Our foodie friends Dan and Lisa have 6 kids and we have 2. That would be freakin' EXPENSIVE if we both got babysitters for our kids just to have a dinner party together. So....don't. We plan our dinner parties later in the evening, like around 7:30-8pm. We always go over to their place because it is bigger, with more room, toys, etc for the kids and it also makes it easier putting the kids to bed. We both feed our kids at home around 5:30-6pm or so, and then we go out to Dan and Lisa's place. They put a movie on for the kids so they are all in one room together, being quiet and out of the way. Then they put their kids to bed, and we use their playpen and put our kids to bed. Works out great! By the time we are eating and enjoying each other's conversations we are all kid free! - Aggie's Kitchen had a great idea by throwing an Adult Pizza and Ice Cream Social. If you make your pizza dough and ice cream from scratch, and use produce and herbs you have growing in your garden, this could be an extremely frugal way to have fun with your friends. - Or you could throw an Irish, (or if it fits a St.Patrick's Day) dinner party like Stiletto Money did. 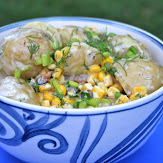 She used really inexpensive ingredients like potatoes, cabbage and corned beef and by having it centered around the Irish theme, it didn't seem "cheesey" to serve those items to her guests. - Probably the most frugal dinner party I've ever seen was Nourished Kitchen's Recession-Proof Dinner Party. Neither she or her guests spent any money! Now that's the way to throw a frugal dinner party. The host provides a flavorful homemade broth along with homemade bread, and each guest brings an item they had in the fridge, pantry or freezer to go in the soup pot. Such a great idea. This is pretty common sense, but if you invite more people it will definitely cost you more money to prepare food for them. Keep the number of invited guests smaller and it won't be such a strain on your budget. This is where planning your meal a week in advance really helps. You can watch your store flyers and the current sales & deals and plan your meal accordingly. With a little creative planning, you can also choose really inexpensive ingredients to serve like pasta. Fancy it up by making a homemade cream, pesto or tomato sauce and rather than using meat in the sauce, use portobella mushrooms and roasted red peppers. Your guests will feel spoiled yet you really didn't spend a lot of money. With a meal like that you just need to fill it out with some bread (homemade to make it cheaper) and a nice salad with homemade balsamic/oil dressing. I'm not necessarily a huge fan of potlucks....you always end up with a weird assortment of food on your plate like stir-fry, pasta salad and jello with fruit. If I'm going to ask my guests to bring items, I would rather all the food center around one theme. I have a friend that likes to throw a Mexican Fiesta party a couple times a year. She provides the taco meat, soft and hard shell tortillas and then asks her guests to bring other items. Her guests bring things like salsa's, cheese, sour cream, pico de gallo, refried beans, guacamole, and Taco Rice with Corn and Black Beans. It's always super fun and delicious. We also use that same idea for our International Dinner Club. We choose one culture's cuisine to focus on for the month, and everyone brings dishes from that country. You can really class up a meal by typing up the menu and and frame it with some cardstock. Super cheap, but looks so nice. That's what Five Spice Duck did for her dinner party and it looked great. You can also look around your house or out in the garden for really great centerpieces for the table. Some handpicked flowers, or even twigs and leaves in a beautiful vase can really add to the ambiance. Dinner parties can definitely be done on a dime. So have fun and invite your friends over to share in some great food! Great tips, thanks so much. I especially love the homemade decoration tips. Have you ever tried hosting or been to a Chocolate tasting party? You can even host these parties for free. Check out the Dove Chocolate Discoveries webpage for more information and great recipes and tips.